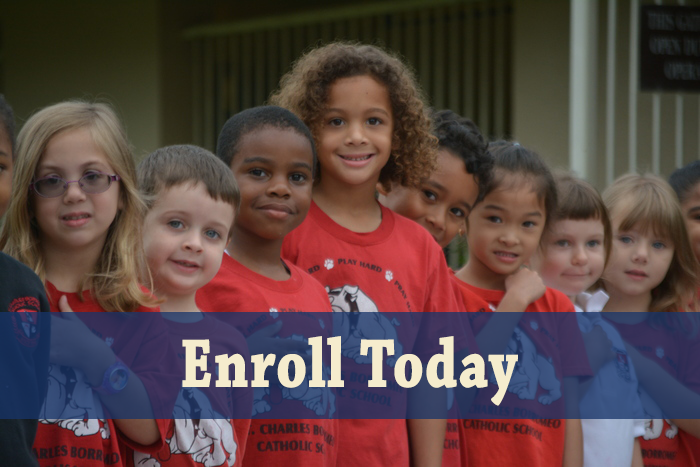 Orlando Catholic students who show demonstrated financial need and do not qualify for the Florida Tax Credit scholarship programs may apply for assistance from St. Charles Borromeo through FACTS Tuition and Aid. FACTS is a third party agency that assists with the gathering of information and makes recommendations to the school. Tuition assistance awards are based on the family’s demonstrated need as determined by FACTS Tuition Aid. Requirements: Student must be a registered practicing Catholic and family must have applied for the Florida Tax Credit scholarship program in order to apply for FACTS Tuition and Aid. To expand educational opportunities for children of families that have limited financial resources and to enable children in this state to achieve a greater level of excellence in their education, the Florida Legislature created the Florida Tax Credit Scholarship Program in 2001. The law provides for state tax credits for contributions to nonprofit scholarship funding organizations, (SFOs). The SFOs then award scholarships to eligible children of low-income families. St. Charles Borromeo works with two scholarship funding organizations (SFOs), Step Up for Students and A.A.A. Scholarship Foundation. Families may apply to either or both agencies; however, may only be awarded assistance through one. Each of the Scholarship Funding Organizations (SFO) below are approved to administer the Florida Tax Credit Scholarship Program and the Gardiner Scholarship. Please contact the SFO to determine the programs they administer. The McKay and Gardiner (formally PLSA) scholarship programs are state funded scholarship programs designed to serve students with disabilities who meet specific guidelines set forth by the State of Florida. St. Charles Borromeo participates in both scholarship programs and adheres to all program guidelines given by the state. The McKay Scholarship program for Students with Disabilities ensures that no child will be left behind by allowing Florida students with an active IEP or qualifying 504 plan from a Florida public school the opportunity to attend a participating non-public school. The parent has obtained acceptance for admission of the student to a private school that is eligible for the program. The Gardiner Scholarship Program provides eligible students a scholarship that can be used to purchase approved services or products in order to design a customized educational program for the student. Scholarships can be used for specialized services such as speech or occupational therapy, instructional materials, tuition at an eligible private school, contributions to a college prepaid account and more. The program is directly administered by state-approved nonprofit scholarship funding organizations. Who is eligible to receive a Gardiner Scholarship? Autism spectrum disorder, cerebral palsy, Down syndrome, an intellectual disability, Phelan-McDermid syndrome, Prader-Willi syndrome, spina bifida, muscular dystrophy, Williams syndrome or a high-risk child as defined in s. 393.063(23)(a), Florida Statutes. Is the subject of an IEP (individual educational plan) written in accordance with rules of the State Board of Education or has received a diagnosis of a disability as defined above from a physician who is licensed under chapter 458 or chapter 459 or a psychologist who is licensed in this state.